Many buyers will assess a company according to how well the books of the company are kept. You should have the following documents easily at hand and up-to-date: up-to-date management accounts, financial statements for the previous financial year (better last 2 years), Asset list with credible valuation, VAT returns for the last 12 months, signed lease agreements, signed employee contracts, Copy of Lease / HP agreements with settlement figures and any contract of significance. 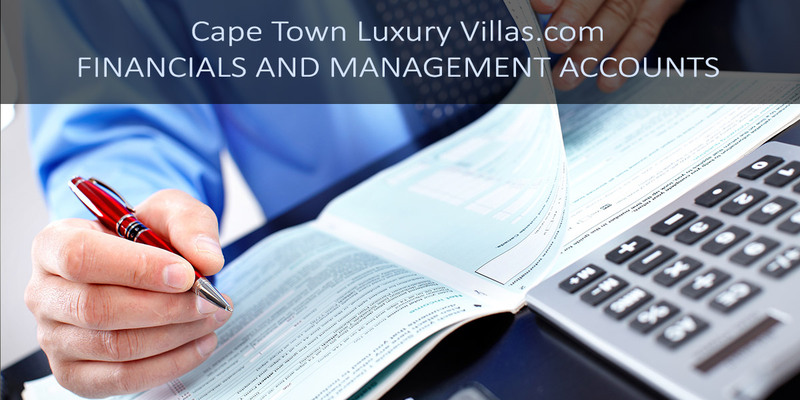 Management Accounts: The Cape Town Luxury Villas management accounts have been created to become a part of an automated financial system that we are developing. When presented to accountants Williams and Co, senior accountant Paul M Smith (BSc Honours FCA) mentioned that the management accounts were far superior to what is usually presented. And as a result it took only two billable hours to create the company’s UK tax return for Villa Secretes Ltd., the parent company of Cape Town Luxury Villas. Financial Statements: Cape Town Luxury Villas operated as a franchise to Villa Secrets paying about 25% of turnover as a franchise fee (this equates to just over 4% of income). The financial statements for Villa Secrets are readily available. To verify total turnover one multiplies the franchise fee of £19,300 (R386,000) by four to create 100% and £77,200 (R1,544,000). However actual turnover was £71,726 (1,434,000) why the difference? This was due to some booking deposits between May and September being paid for, but not recorded on the Cape Town Luxury Villas ‘Budget Master’ spreadsheet. The Budget Master spreadsheet is used to record each booking and create monthly management accounts. We have the statements for Villa Secrets receiving 26.9% of turnover which when added the additional 73.1% creates 100% turnover. We have the ‘Budget Master’ spreadsheet created by Cape Town Luxury Villas previous management recording bookings creating a similar figure. In addition to the above, we have the new team from Cape Villas that are now answering enquiries for Cape Town Luxury Villas. Who generated R262,000 in their first full trading month February 2016. An excellent result up over 100% on the previous managements 2016 average. Cape Villas’ results is particularly interesting as it will show again how new management can make money from the website instantly. Impressive if selling a franchise and Impressive if selling the business. The videos present due diligence on the above valuation designed to be validated as a credible valuation by any quality web development company. VAT returns for the last 12 months: Villa Secrets is not required to be VAT registered in the UK at its current turnover. The previous management of Cape Town Luxury Villas were not VAT registered, however VAT has been accounted for at a cost of 14% within the accounts that provide the owner discretionary cash flow statements. Signed Employee Contracts: Cape Town Luxury Villas was previously run by the two owner operators. They did not have staff. Copy of Lease / HP agreements with settlement figures and any contract of significance: There are no such contracts. 1. Plus, total compensation of a single owner-operator. 2. Plus, adjustment of all other working owners’ compensation to market rate (manager replacement). 3. Plus, annual depreciation and amortization expense. 7. Plus, expenses not related to the business operations. Every buyer will need to see what the true yield of your company is. Any experienced business broker will be able to give you a recasted income statement before you start marketing your business. Cape Town Luxury Villas was manned by a two-person team; both being paid as owner operators from discretionary cash flow. If the business were to be sold to a partnership, and point 1 was amended to reflect this. Then according to the accountants the true income for the owners would be R1,018,000. If one goes strictly by the formula presented above with only one owner and we need to account for the second owner’s replacement as a paid manager. Then a figure of about R25,000 a month would need to be deducted (R300,000 per year). So lowering the true income for the owner to R700,018. Later on the valuations page, we deduct R100,000 for the hire of a small office and contibutions to pertol and phone bills. It takes an experienced Business Broker to help you establish the right value to market your business. Remember, the market value of your business is the estimated amount for which a business should exchange on the date of valuation between a willing buyer and a willing seller in an arm’s length transaction after proper marketing wherein the parties had each acted knowledgeably, prudently, and without compulsion. Do not accept the simple rule of thumb valuations that inexperienced brokers will try to explain to you. Valuations like straight multipliers of earnings, revenues or gross profits are not acceptable. According to the International Valuation Standards (IVS) published by the International Valuation Standards Council, an accepted method of valuing a business would be an average of at least 3 methods. This section will need to be re written after discussions with Aldes, as a brief look at the website for International Valuation Standards Council and a look at their reports did not present any ways to value a business. We will need to be guided to the section within the report that presents the different ways to value the business. For now, we have looked at the top results in a search from Google UK. 1. The value of the business’s assets: What does the business own? What equipment? What inventory? After all, you’d have to buy all the same stuff if you were starting a teashop from scratch, so the business is worth at least the replacement cost. The assets for Cape Town Luxury Villas is its website, software, database of direct to owner contacts for villas and its supporting systems such as AdWords and AdRoll. For the website and software we have valued for the replacement cost, not the actual cost. The website and software actually took 4,500 hours. However we have only presented 1750 hours, a figure that will not be argued as a replacement cost by any quality web development team. 3. Warren Buffett’s discounted cash-flow analysis. Which looks at how much cash the business generates each year, projects it into the future and then calculates the worth of that cash flow stream “discounted” using the long-term Treasury bill interest rate. One quick and dirty technique is to divide the current yearly earnings by the long-term Treasury bill rate. For example, if the shop earns $10,000/year and T-bills are returning 3 percent interest, the business is equivalent to $333,333 worth of T-bills ($10,000/3 percent=$333,333, so $333,333 invested in T-Bills would return the same $10,000 income). Presuming in the above ‘current yearly earnings’ are the discretionary cash flow to owner (shareholder profit.) which equal R1,018,000, which in turn (on 28th Feb 2016) = $63,000. Then we use $2,100,000 x 3% = $63,000, so $2,100,000 invested in T-Bills would return the $63,000 of income. This seems like a very inaccurate way to estimate the value of a business! 4. Multiples of Net Profit. Most sectors of business have a formula for valuing the business based on a multiple of net profits. Accountants can usually provide the multiple for your sector. If the multiple is, for example, five times net profit, then the value calculation is simple. a. An owner-run business can ask for a higher multiple when there are staff who are able to run the business when the owner is not there. When the business is not dependent on the owner, it is more valuable. b. If the business has a unique system that sets it apart from the competition, that increases the multiplier further. c. The next level of increase comes by having the business be capable of bringing substantial new product ranges to market. d. After that comes the ability to create new distribution channels that bring new clients to the business. e. Then, if the business creates a strong brand that affects everything about the business, the multiplier increases still further. f. The multiplier peaks when the business proves that it is scalable and could be rolled out nationally, for example. In all cases above Cape Town Luxury Villas scores: The business traded without the assistance of the owner. The business has many unique systems. The business has the potential to gain sole mandates on villas and so create new product ranges to the market. Villa Secrets are creating the ‘Villa Cloud’ and other systems to bring new clients to the business. Villa Secrets is intent on creating a strong brand, that effect everting about the business including internationally distributed magazines, intense content marketing and the creation of video. Note, the future owners of Cape Town Luxury Villas are advised to purchase the company as a non-fee paying business that is a member of Villa Secrets. Note Villa Secrets does not rent villas or contract mandates. Villa Secrets promotes members of its network. In looking at various sources the multipliers of net profit are between 2.5% and 8%, considering Cape Town Luxury Villas scores highly on all points mentioned above then at the least the multiplier should be 4. As such If we consider the shareholder profit (discretionary owner cash flow) for a partnership is R1,018,000 and multiply by for we see just over R4,000,000. 5. Multiple of ‘Normalised’ Profits. Average monthly/annual profits are adjusted to not include one-off factors like exceptional costs, one-off purchase. This will give you a good indication of immediate future profits. You’ll then need to add on any additional costs or gains that the company may make after being sold or invested in. This final profit figure is generally called ‘normalised’ profits. To find a suitable valuation for your company, multiply this figure by anything between 3 and 5 times (this is the norm). Be careful not to overvalue your company at this point – smaller businesses should be at the lower end of this scale whilst most larger companies with a strong reputation can be towards 8 times. This method is generally used by businesses with a track record of profitability. This figure is complex, as there are competent strategies which will increase the profitability of the company that are considered on their own merit. See the Strategic Growth Plan for Cape Town Luxury Villas and its accompany Spreadsheet which details 92 different points that will increase profit or save money mostly from using the systems described within ‘Software in development – ‘VS Mobile,’ ‘Magic Menus’ and ‘Software to be developed – ‘Divergent CRM’. as such ‘normalised’ profits including upgrades are at the very least R8,000,000 (+/- $500,000). 6. Lastly if the buyer or franchisee was already in the industry, the value can be valued by its customers, the amount of enquiries it generates. Cape Town Luxury Villas generates about the same amount of enquiries that Cape Villas.com produces, despite not having a 14-year track record of previous clients. Currently we have about 500 enquiries within a system that can be assessed. An experience agency would likely value these enquiries consistently with the R4,000,000 discretionary owner cash flow valuation seen above. If working on the 4 year multiple. Alders Atlantic have suggested an accepted method of valuing a business would be an average of at least 3 methods. This we presume does not include the company assets valuation which should be added to the average methods for business valuation per current and future performance. However, we await word from Alders Atlantic to guide us to the section with the International Valuation Standards Council which presents valuation methods. It is illegal to charge commission if the broker is not in possession of a valid FFC. Allows for optimal marketing to a broad audience of potential buyers. Aldes is the most respected business broker in South Africa, staffed by persons with real life experience in business. There are usually two standard ways of contracting with a business broker. An open mandate has no set time period and can be given notice any time. The fact that the mandate is open means that there can be more than one party working on the mandate at the same time. This has disadvantages, the most obvious being a possible breach of confidentiality when you have too many people punting your confidential information around. This is a mandate whereby you contract with a single Broker or (as with Aldes) group of Brokers for the sale of your business on an exclusive basis. The mandate usually has a time period of 6 to 12 months. It goes without saying that you need to select your Broker very carefully if you contract with him exclusively. If you have convinced yourself that the selected Broker can offer you the best exposure and service, there are a number of advantages to an exclusive mandate. Being in the industry where exclusive mandates are precious, we are fully aware of the advantages of an exclusive mandate. However, we need to consider the Villa Secrets franchise plan as a part of sale process of Cape Town Luxury Villas. It is mentioned that the mandate time is usually between 6 and 12 months. However, within two or three months Villa Secrets intends to approach (or have Alders approach) one of the big South African estate agents with intent on creating a ‘super franchise’ a collection of websites which if not sold may include Cape Town Luxury Villas. In this case Villa Secrets are not looking for a large franchisee fee, rather a commitment to staffing the Cape Town office, and positive discussions regarding the creating of new Villa Secrets offices in the Seychelles, Mauritius and other prime African locations. Following on from this ‘super franchise’ or as we say ‘Primary Network’ Villa Secrets has identified over 90 other locations that require franchises. It would likely be more profitable in the long term for Alders to broker the franchises, not the single sale. However, as they say, ‘cash is king’ a good sale price would guarantee funding to hire additional programmers and create the ‘Divergent CRM’ and place us on 4 continents by the end of the year. If a sole mandate is agreed upon it needs to include the flexibility and will to assist Villa Secrets in selling franchises. There is no text on franchises that we could find on the Aldes website. However we believe that the right broker could assist greatly in the selling of franchises. In particular, we have identified Andrew Hubbard as ‘the right broker’ due to his experience in software companies and Hotel chains. It is hoped that Andrew Hubbard will be uniquely qualified to assess and sell franchise for a travel company that is at its heart a software framework. That intends to succeed where others do not, due to the software it is creating and the web framework that it supports. In addition to the brokers buyers list we have a list of about 30 potential buyers, and a list of favourites from within that list. Local Villa Rental companies, local tour operators, international villa rental companies and international travel companies will all appreciate the enquiries and shareholder profit. International companies and local tour operators would also see great benefit from the portfolio of villas. Note Cape Town Luxury Villas has the database of Cape Villas, Razor and its own selection of villas, which collectively make the largest database available on any website. In many cases the Google AdWords account, the long tail keyword SEO success and the software development in place and in creation will be desirable to both local and international buyers. Statistic show that sellers offering seller finance for between 10% and 40% of the purchase price will achieve an up to 18% higher purchase price for the business. The simple reason for this is that the buyer that really wants your business, but can’t really afford to pay the purchase price in cash, will be guided by a good broker to rather offer a higher price for a structured deal, than compromise on the choice of business. On the other hand, if you do not need all of the cash immediately, you could charge the buyer an interest rate that is substantially higher than the rate that you would achieve if you had to invest the money at the risk-free interest rate. The interest plus capital could be a very nice source of income for the next period of time, and can be structured to be very tax effective. The business effectively remains yours until full payment of the purchase price, so that the risk is fairly limited. Another advantage is that you are clearly showing your confidence in the business by accepting this kind of deal. We are not opposed to seller finance, making a sale over two or three years with stage payments is an option we would consider. The money generated from the sale will be reinvested mainly in software development and content marketing staff. In a two-year development project, so long as we have the finance for our development, we are happy to be paid in stages. 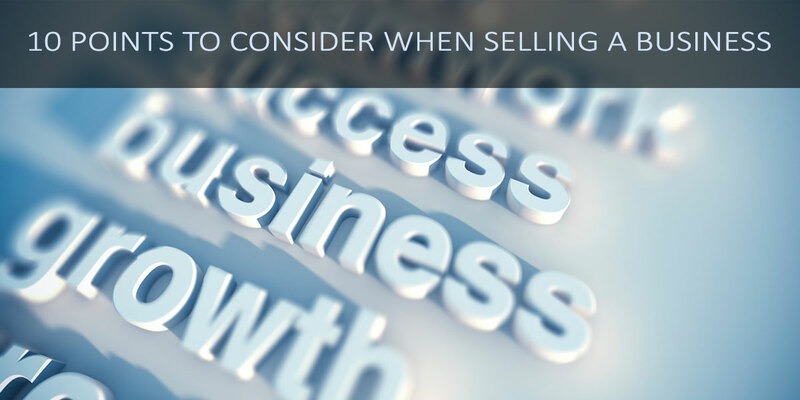 One of the most important aspects of selling your business is to restrict your focus to buyers that are willing to sign a confidentiality agreement, while at the same time providing a clear indication of the ability to finance the transaction. You are providing potential buyers with the most intimate details of your operation, so it is only fair to expect the same from the buyer. In our limited experience (1 test) potential buyers from other agencies are happy to sign a confidentiality agreement. It is par for the course in the technical side of the industry. In terms of qualifying the buyer, as Cape Town Luxury Villas is the prototype for Villa Secrets its success, as a franchise or as a not franchised member of Villa Secrets is important to Villa Secrets. The better Cape Town Luxury Villas does in Cape Town, the more attractive a website created from the Villa Secrets framework in international locations. For both franchise and member deals. For instants St Bart’s, where villas are more expensive and there are more of them, but advertising on Google is cheaper. In terms of selling a Villa Secrets website (one we had acquired a good level of inventory) one could imagine a figure of $1 million. Or more if Villa Secrets magazine was created or in the pipeline. As such, when considering buyers if all else is even we would sell to the buyer who was likely to have the most success. With the assistance of the broker this is the most important aspect of the whole process from your perspective. The broker will act as an intermediary during this process until such time as an agreement has been reached between the parties. It is important to focus on all important aspects of the deal, including, but not limited to: Payment of Deposit, effective date of the transaction, due diligence period and process, Take-over period with involvement of seller, payment of full purchase price, possible interest and security. General Note, Nick Ray Ball does not enjoy the actual selling process, he is happy to prepare material and work with the sales person on perfecting the material. However, he is keen to work on the software and international development. Nick of course appreciated that any purchaser of Cape Town Luxury Villas or international franchise partner would need to discuss this matter CEO to CEO. So long as the sale price is not a part of this conversation Nick Ray Ball is keen to help and discuss and CEO in regards to the effectiveness of the system. And indeed give individual advise of the path and CEO should take. The Due diligence process is without doubt the most painful period of the whole process. You as the seller really want to bank the money and move on with your life now that you have the deal. The buyer’s biggest fear on the other hand is to pay across his hard earned money, only to find that he has been ripped off. You should be totally proactive during this period to show the buyer that he has bought a good business, and that there are no ‘skeletons in the closet’. Your broker will act as an intermediary between the parties and should be able to manage any issues that may come up and advise both parties accordingly. Beware of the broker that is never to be seen again as soon as the signatures are on the contract. In terms of elevating the fears of the buyer of being ripped off, we represent Nick Ray Ball’s commitment to a polygraph on this point or any related point. We are prepared for Due Diligence. however, the buyer should be aware of what we have and what we do not have before the Due Diligence process starts. We have banking data that shows we were paid 26.9% of actual turnover by the 2015 Cape Town Luxury Villas management. These financial data have been submitted by Williams & Co accountants to HMG revenue and customs UK. As such one can assess the total turnover as the money recoded by Villa Secrets plus the additional 73.1%. This data matches with the individual booking data (the Budget Master) presented by the previous management. The previous management may well have not included some bookings on this spreadsheet. However, there is no way the previous management would have mistakenly added bookings to the ‘Budget Master’ as they would have had to pay out money that they did not have to. And this was checked by them on a number of occasions. We do not have the bank statements from the client to owner bookings made by the 2015 team. We could probably compel them. We approached Bowman Gilfillan regarding this, however they asked for a R100,000 deposit before looking at the case, so we decided to wait and see what lawyers Aldes recommended instead. If this is a necessary action. On the 7th March 2016 we will have access to the first month and a half trading figures from the new managers of the site in a separate accessible bank account. Each month that goes by we will provide more data, and we expect to do well after March, as currently the management team are run off their feet with too many enquiries, as they are also manning www.CapeVillas.com. Indeed, there are so many enquiries they have asked Villa Secrets to stop new marketing for the next 6 weeks. Lastly, in Due Diligence we represent our willingness to accept a two or three-year payment plan as we are confident in the future success of Cape Town Luxury Villas. In this regard it has been a very useful exercise seeing how well the new management team performed. there was no fluke, no surprises. The site generates enquiries and has the stock. It’s just a matter of converting them. And to improve we have the Strategic Growth Plan for Cape Town Luxury Villas and the systems described within ‘Software in development – ‘VS Mobile,’ ‘Magic Menus’ and ‘Software to be developed – ‘Divergent CRM’. The software options will be sold as ‘additional items’ to be paid for one by one, or in the case of the Divergent CRM as different components are created and working on or for the Cape Town Luxury Villas.com website. These ‘additional items’ will be paid for after instillation is complete, tutorials are created and the management has used or benefited from the systems. After a long running dispute over marketing, in mid-December 2015, Villa Secrets changed the Cape Town Luxury Villas management, this transition took up to the 18th January 2016. At which point the we restarted the Google Ads campaigns and the management team from Cape Villas.com starting receiving the enquiries from Cape Town Luxury Villas. This exercise proved very useful, as in February 2015, in their first full month the new team made double the average profit of the old team, showing to any potential new owner or franchisee, that the business model is a success and will show results immediately. In its first full month, February 2016 the new team from CapeVillas.com made 140% more turnover than the old teams 2015 yearly average. Williams and Co accountants, who create the Villa Secrets tax return valued the 2015 shareholder profit as seen above. If a like for like management structure, with a pair of directors contributing their full time to the venture, working from a home or pre-existing office. Or an existing travel company took over directorship. However, in point 2 of Aldes Atlantics 10 Points on Selling a business it suggests one should calculate shareholder income on a single director. With manager replacement compensation for a second director. If so then 2015 shareholder profit would be about R300,000 less at R700,000. However as the desired purchaser or franchise or Cape Town Luxury Villas would not be a single owner/director instead a partnership, in valuations, we have used the Williams and Co Shareholder profit.